BlogHome » Firm News » Firm News » When Something Happens to You, What Happens to Your Estate? When Something Happens to You, What Happens to Your Estate? What is the “Disability and Death Expense Funnel”? 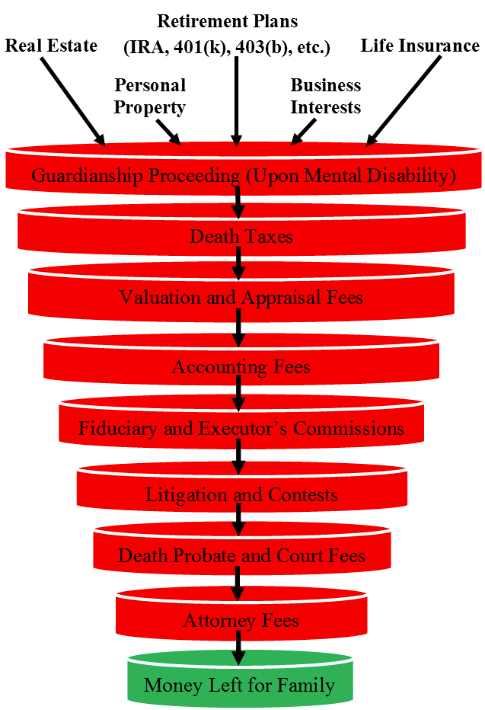 The Disability and Death Expense Funnel illustrates potential outflows of wealth from your estate if it must endure undue taxation, fees and court costs. Your estate (i.e., retirement plans, personal property, real estate, life insurance, business interests, etc.) may be unnecessarily and negatively affected by any one or more of the funnel obstacles. In other words, encountering any of the funnel obstacles can lessen the value of your estate, and therefore your family may be left with less. The key to getting more to your family upon mental disability or after death is avoiding undue taxes, fees, expenses and headaches associated with the funnel obstacles. Having a mindful estate plan in place allows you to avoid funnel obstacles and the associated time and expenses. For example, a typical death probate estate may take a year to close, but many take much longer. The expenses associated with death probate may also be a burden to your family. The cost of death probate varies by state and the complexity of the estate, but fees can range from a couple thousand dollars to hundreds of thousands of dollars. A proper estate plan may allow your family to bypass the probate courts and save time, money and grief. 4. Control and protect assets after death (i.e., protect children from divorce, bad spending habits, children’s creditors and the like). For more information on how to bypass the Death and Disability Expense Funnel, call Andrew Kelleher, David Buckley or any of our estate planning attorneys at 847-382-9130 for a free consultation. previous post: Life Settlements – What Is Your Policy Worth? Cash In?